Well this is fast becoming a food blog, clearly. When you buy a house and can’t afford to jet away constantly you need to find a new outlet… Mine is stuffing my face, I think. But in an artsy, look-what-I-did kind of way, hopefully. Anyway, tonight was curry night. I’ll be honest, hubby did most of the work. I just stood around and looked good (duh). And fetched beers. Last night we marinated some chicken in a Madras sauce. I thought hubby was being lazy by leaving it in a casserole dish and baking it but alas, he is a genius. 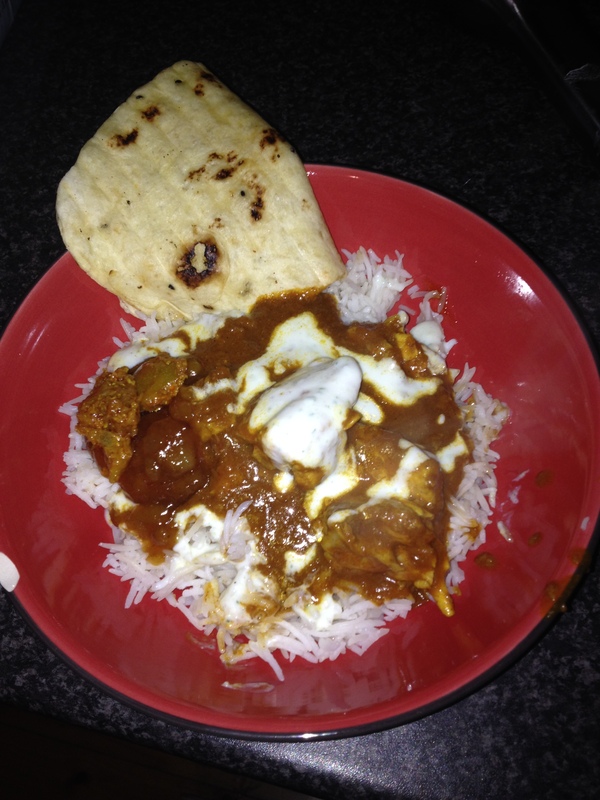 The meat was perfectly tender and completely packed with flavour, just like you would get at an Indian restaurant. Took about the same time as it would on the stove top but with amazing results. Served with roti (slightly toasted), raita (yoghurt, cucumber, garlic and a little bit of mint), mango chutney and lime pickle (my favourite! )… I was actually dancing up and down the hallway with excitement while it was cooking and it didn’t disappoint. The below photo probably will though; I’m a food eater, not a food photographer. Hit me with your favourite curry making tips. I promise I will gobble them up (insert creepy wink face here).